Are you heading to the range soon? These new production 357 SIG rounds are a great option for range training and target shooting. This ammo is available for purchase due to cosmetic damage to the original packaging. If the box is damaged but the ammo is unscathed, we repackage the rounds into loose bags of 100 and sell them to you at a discount! 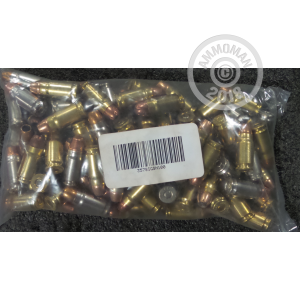 When sorting our mixed bag ammo we separate the rounds by casing type, so every round in these bags will come in a re-loadable brass or nickel-plated brass casings. You can expect to see different manufacturers and bullet types in these mixed bags. For the 357 SIG the most common bullets will be FMJs but you may see some premium self defense round mixed in as well. Don't forget at AmmoMan.com all orders over $99 will ship for FREE! We have very limited quantities of this product so grab them while you can!